Upon on your arrival at Nagoya Centrair Airport, please take a Meitetsu Airport Bus bounding for Okazaki, and get off at Higashi Okazaki Station. The Airport bus stop is located at the 1st floor of the Passenger Terminal Bldg. On your way back to the Airport, please take an airport bus from Meitetsu Higashi Okazaki station. 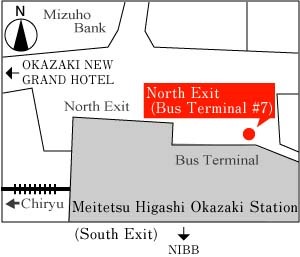 The bus stop is located on the north side of the Meitetsu Higashi Okazaki station, and please takes a bus from the bus stop #7.